Lithuanian lands were united under MINDAUGAS in 1236; over the next century, through alliances and conquest, Lithuania extended its territory to include most of present-day Belarus and Ukraine. 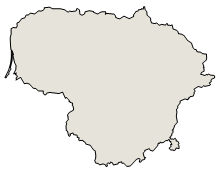 By the end of the 14th century Lithuania was the largest state in Europe. An alliance with Poland in 1386 led the two countries into a union through the person of a common ruler. In 1569, Lithuania and Poland formally united into a single dual state, the Polish-Lithuanian Commonwealth. This entity survived until 1795 when its remnants were partitioned by surrounding countries. Lithuania regained its independence following World War I but was annexed by the USSR in 1940 - an action never recognized by the US and many other countries. On 11 March 1990, Lithuania became the first of the Soviet republics to declare its independence, but Moscow did not recognize this proclamation until September of 1991 (following the abortive coup in Moscow). The last Russian troops withdrew in 1993. Lithuania subsequently restructured its economy for integration into Western European institutions; it joined both NATO and the EU in the spring of 2004. Lithuania gained membership in the World Trade Organization and joined the EU in May 2004. Despite Lithuania's EU accession, Lithuania's trade with its Central and Eastern European neighbors, and Russia in particular, accounts for a growing percentage of total trade. Privatization of the large, state-owned utilities is nearly complete. Foreign government and business support have helped in the transition from the old command economy to a market economy. Lithuania's economy grew on average 8% per year for the four years prior to 2008 driven by exports and domestic demand. However, GDP plunged nearly 15% in 2009 - during the 2008-09 crisis the three former Soviet Baltic republics had the world's worst economic declines. In 2009, the government launched a high-profile campaign, led by Prime Minister KUBILIUS, to attract foreign investment and to develop export markets. The current account deficit, which had risen to roughly 15% of GDP in 2007-08, recovered to a surplus of 4% 2009 and 3.5% in 2010 in the wake of a cutback in imports to almost half the 2008 level. Nevertheless, economic growth was flat and unemployment continued upward to 16% in 2010.